We were very fortunate to have a long Winter Break - two full weeks. And then Mother Nature decided that wasn't enough. Heh. Today was our third calamity day for 2014 and the fifth for this school year. And I ain't complaining! I love unexpected days off (and today was a particularly unexpected one). January 2nd was a very snowy day and I got a number of photos from my folks' veranda, one of which I'll share below (once I pick it). So we spent the day inside and enjoyed each others' company. (I'd originally planned to take the kitties to their annual appointment, but decided to change it to another day.) A friend of Amy's and former student of dad's came around despite the crappy weather (he and his family were on their way to Chicago, but decided after the drive to Troy to give it up and return to Pleasant Hill). We had a nice time visiting with them. And then mom and Amy went to the post office and dropped me off at the Chinese place so I could get us lunch. It was a lovely snowy day. Sadly, the 3rd was Amy's last day with us, so we spent the morning just watching her. Heh. We got her off to the airport and she arrived home safely. Her luggage took longer, but she was finally reunited with it in the late evening. I also made my way home and got to spend the weekend (and the past 3 days) with my kitties. Sunday was supposed to be the next big snowstorm followed by ultra-cold temps. Well, the snowfall wasn't all that big, then it turned to rain. Still, I spent the day making soup and baking bread. It was lovely. The ultracold temps did come and turned the wet into ice and the rain into snow. And thus school was closed Monday. And then Tuesday. By Tuesday afternoon, I was getting cabin fever, so I put on double/triple/quadruple layers and walked to the post office. Amy's birthday gift to me (the game Ticket to Ride) showed up. Yay! I returned home with all of my appendages doing just fine. Last night the school called to say we would be on a 2-hour delay this morning. So this morning I was up an hour later than I normally would be, and getting ready for work. And then they called again to say that, due to poor roads, school would be closed again. Whee! I figured the main roads wouldn't be as bad as the country roads and by 11am, I headed off to Piqua to go watch The Hobbit: The Desolation of Smaug for a second time. Turns out Piqua can show it in High Frame Rate. No more going down to Fairborn for HFR! Whee! I followed it up with a late lunch at Red Lobster. 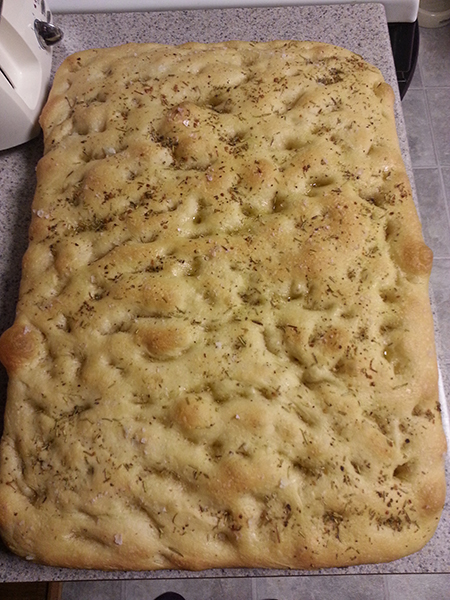 I also baked my first focaccia bread today (after making the dough yesterday and letting it proof today). Photo also included below. So anyhoo, my Winter Break is now over (probably! Hopefully the salt could finally melt the ice on the streets!) and tomorrow I can be a responsible adult again. Heh. Till then, however, I'm gonna sit in my comfy chair with my kitty (Lucy right now) and veg out. Hope y'all have had an interesting start to 2014, too! Here are the two photos I promised! 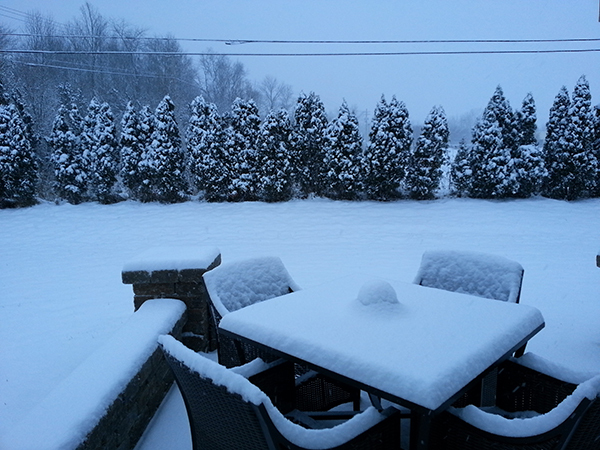 The patio doesn't look as inviting when there's several inches of snow on the furniture! My first attempt at focaccia! It looks (and smells) wonderful! I wouldn't sweat the 5-lb weight gain; it's normal for me to vary that much on a daily basis (though that would imply that I weigh myself every day and no, that's not the case) & besides, it was the holidays. I don't know how anyone gets through those without gaining weight except those blessed/cursed with a super fast metabolism. Not too worried about the 5lbs. Indeed, was down 2.2lbs from last week's weigh in. But I'd like to get under 210lbs again. It was kind of nice being under that. Will be even nicer when I'm under 200lbs (which I'm pretty sure hasn't occurred in 20 years).